August 2nd was Day Two of Contest Musica Live and day three of the Festa. At 9:00 PM – dressed to the nines and with my party attitude on – I left Jack snoring on the couch and forcing myself to put one tired foot in front of the other drove down to the piazza. Gulp, I was going to a concert alone. Who would I talk to, where would I sit, would I know anyone there? The questions I just typed may have floated through my insecure 16 year old brain but the 65 year old knew that I would talk to everyone, sit where I wanted and – hey this is Pontelandolfo – I would know folks. 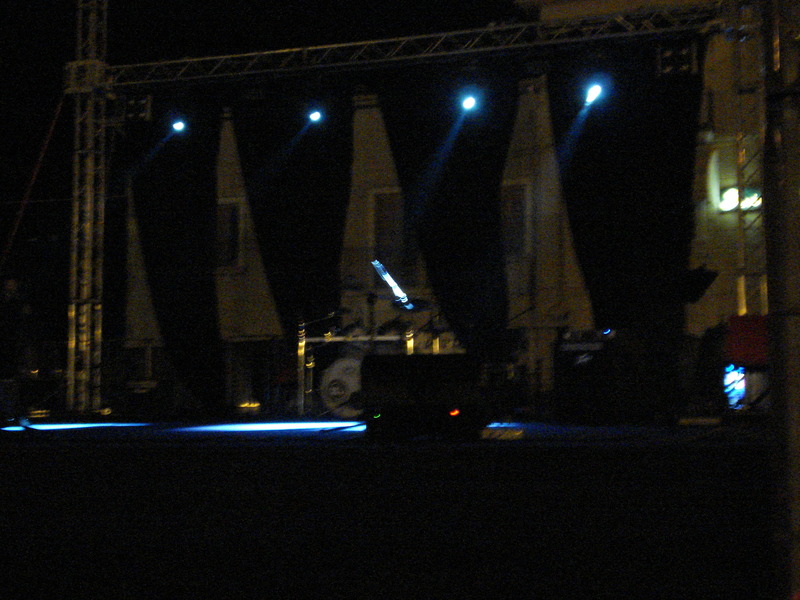 Look – a pre-lit stage! Wow, somebody noticed that the stage didn’t look so professional for the first day of the talent contest or else they hired a different company for Day Two. The set up was much more professional looking. There were blacks up stage – black curtains across the back of the stage and a different light set up. Jack said how do I know these things – I just know OK. You’ll see on the video. The pre show started at 9:50 – a lot earlier than the day before and almost on time! (The show was scheduled to start at 9:30 PM.) The MC – who over the week I began to loathe more and more – did his usual warmup. When the first group came on stage, folks started pouring into the piazza – not thousands but a healthy crowd. The opening act was a fabulous singer and band from Pontelandofo! That explained the enthusiastic crowd. I also discovered that the day before many of our talented young folks were performing out of town with our dance company, hence, could not be bopping and rocking in the piazza. They made sure to be back for our home town singer, Eleonora Di Marzo! She was terrific and so was the lighting. From smoke spurts to strobes it was much better rock lighting than the night before. Bar Mixed Fantasy had tables set up that gave a great view of the stage – I bought my Campari soda, grabbed a table and started dancing in my seat. As more folks came, I chatted, rocked and rolled and throughly enjoyed the music, booze, friends and summer night. I am not a music critic but can easily say that the bands the second night were a hell of a lot better than the bands we heard the first night. They excuse Jack had given for not wanting to come – before he drifted to dreamland – was the bands were beh the first night, why should we go and listen to mediocre music. Because it is FESTA WEEK and it is our responsibility to go and support the festa. OK, I want to go because it is always one hell of a party. Let’s go to the video. Midgie, I LOVE your posts, especially this one. Your hometown festa rivals — or possibly beats — the WNEW beach parties on the Asbury Park beach back in the 80s. Keep ’em coming, please.